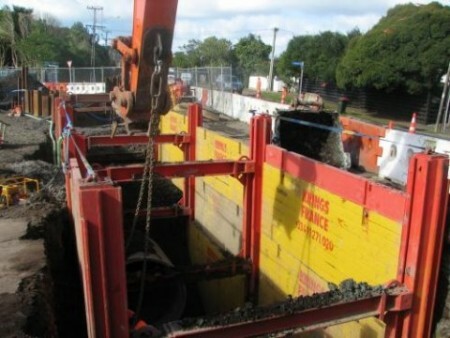 In late 2007 TSNZ and Humes Pipeline Systems promoted the DGVP double slide rail system to engineers designing and planning the Auckland City Council contract for a new large diameter storm water pipeline to be laid along the very busy Abbotts Way roadway, through Remuera in Central Auckland. Kerry Drainage Ltd were awarded the contract and called on the combined knowledge of Krings International France and TSNZ to develop a shoring proposal for this project. TSNZ went to work to import the almost 50 tonnes of shoring equipment from a manufacturing facility in Germany. Since late July 2008, the DGVP double slide rail system has been in use on the Abbotts Way project, providing very safe and efficient shoring for Kerry Drainage to lay the heavy 1950mm diameter Class Y concrete storm water pipes. The 1950 diameter storm water line is 470m long and is being installed immediately adjacent to the kerb at depths of approximately 5m to the pipe invert. Abbotts Way is a relatively narrow road but is a highly used route across this part of Auckland, posing traffic management challenges for the contractor. Using the Krings International France DGVP double slide rail is enabling Kerry Drainage to quickly and safely excavate without compromising the remainder of the road. The configuration of Double Slide Rail in use is up to four sections of rails and panels, allowing a total excavated length of 17.5m. Inside width is 3m to allow enough space for the 1950mm concrete pipe to be laid. Heavy vehicles can pass close to the excavation without risk of subsidence and injury to workers. Another innovation in New Zealand shoring is the Krings International France KKP sheet pile frame and sheet piles. TSNZ have also provided these to Kerry drainage for the Abbotts Way project. The sheet pile frames are 4m long and can be installed in the slide rail system or with the KS100 system. Their purpose is to provide shoring around services, which cross the trench. The frames are installed near the top of the trench and sheet piles are guided into position either side of the cross trench Service. Installation is by the same dig and push method used on all of the Krings International France/TSNZ shoring solutions. The DGVP Double Slide Rail system has been supplied to Kerry Drainage by TSNZ in conjunction with TSNZ's distributor, Humes Pipeline Systems.